We all know that a good massage is a fantastic way to relieve stress and get some good relaxation time. But what if that massage is around your eyes? Will you have the same benefits? The IMAK Compression Eye Pillow promises that the ergoBeads(r) inside it will provide the benefits of massage to two of the muscles you don’t realize you use most. But does it work? Keep reading to find out. Built to alleviate tension at the eyes after a day of staring at a computer screen, the Imak Pain Relief Mask could be great for indoor workers. Looking to improve your sleep mask game? Check out my best reviewed sleep masks page! The IMAK Compression Eye Pillow is surprisingly heavy. I was immediately curious how I could possibly sleep—on my side, no less!—with that much pressure on my face. The box promises that the ergoBeads inside would “create a massaging effect to help increase blood circulation and help promote healthy muscle tissue,” which would be strengthened by keeping the mask in the freezer before use, but I was skeptical that I’d feel those benefits if I was having trouble falling asleep wearing the mask in the first place. The mask promises one of my favorite feature one of my favorite features, though, which is that it sits a bit away from your eyes, taking pressure off your lids and allowing you (if you wish) to be able to open your eyes with the mask on. This is made possible by two purple asterisk-shaped patterns sewn into the mask where your eyes would be, keeping the ergoBeads from traveling toward your lids. 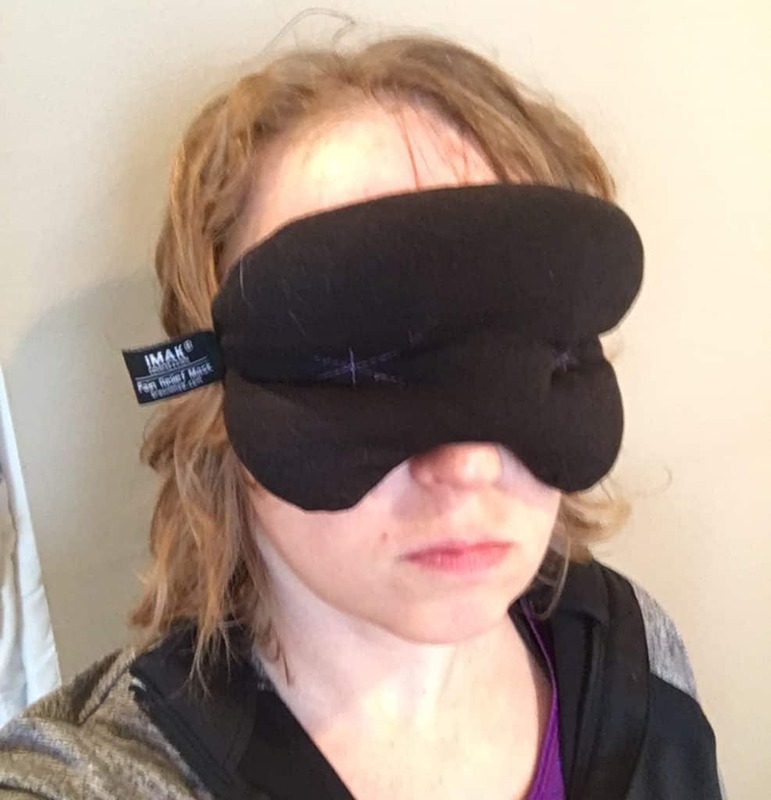 I appreciated that the IMAK Compression Eye Pillow had an elastic band rather than using Velcro; however, unlike many other sleep masks, it wasn’t adjustable in any way, and with the weight of the mask straining the elastic, I had trouble getting the mask into the right position when I had it on. 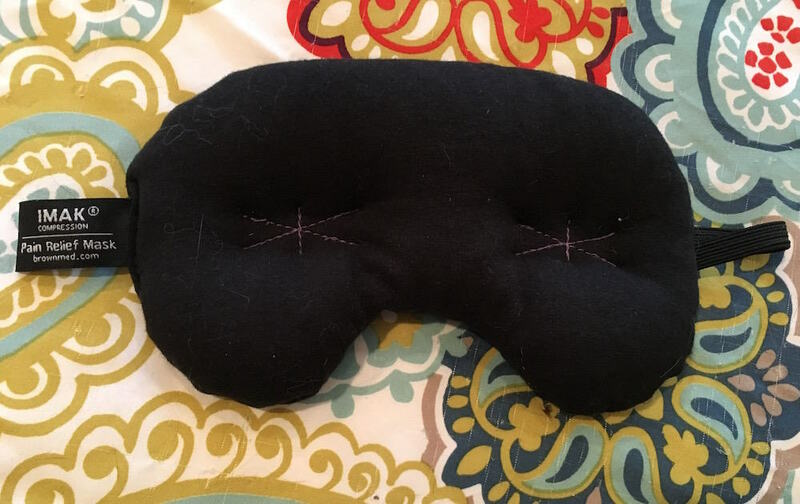 I feel like I should come right out and say that of all the sleep masks I’ve reviewed for Sleepopolis, the IMAK Compression Eye Pillow was one of only a handful that I couldn’t wear all night. Though the cold pressure of the mask felt good for a few minutes, as a side sleeper, I found that having all of the weight of the mask shift toward the side of my face that was against the pillow meant that the pillow was actually being pushed away from my face. It was also annoying to have more weight against one eye than the other—despite the asterisk stitching, the beads to still have the freedom to move around in the mask, and the mask’s stretchy jersey material provided ample give for the extra beads on one side. I felt none of the therapeutic benefits that were promised by the mask’s packaging, and to make matters worse, it couldn’t even sufficiently block out the ambient light coming into my room because the combination of the weight of the beads collected on one side and the too-stretchy elastic strap meant the mask was pulling away from my face. Plus, on top of everything else, the cotton jersey materials used for the mask was like velcro for cat hair. You can probably see it on some of the photos posted here. So what was I missing? 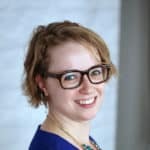 The mask is highly rated on Amazon (including by several migraine sufferers who call the mask an effective source of relief) and makes some pretty big promises on its packaging. It was designed by an orthopedic surgeon! I couldn’t be the only side sleeper to have worn the mask. The morning after my unsuccessful IMAK experiment, I took a closer look at the package and realized a critical mistake: the back of the package says the mask is “great for resting, meditation, traveling strain and for eye relief after hours of computer work and gaming.” What it does not say, anywhere on the package, is that this is a mask you should wear to bed. As such, I didn’t try napping with the mask—I still would have been lying on my side—but I did try resting with it. At some point during a very long and stressful day, I removed the mask from the freezer put some Miles Davis on, and spent twenty minutes reclining, on my back, on the living room sofa while wearing the mask. And you’d better believe it was the most relaxed I felt all week. On my back, the beads were evenly distributed against my face, putting a pleasant amount of pressure on the areas around my eyes without weighing on my eyelids. It was almost completely dark (there was a little light peeping through the bottom, but I was also facing a window in the middle of the day), and the strap, without the strain of the mask pulling against it, kept the mask sufficiently in place. I may have even dozed off! And—bonus because I had a video conference scheduled for 10 minutes after I got up—the asterisk stitching in the mask kept it from smears my eye makeup very much, which would have necessitated touch-up time that I didn’t have. Instead, all I had to do was wipe a couple of small smudges from under my eyes, and I was camera ready. I’m including two ratings for comfort and price below—one for my attempt to sleep with the mask, and a second for my effort at simple relaxation—because otherwise you wouldn’t get the full picture of my experience. 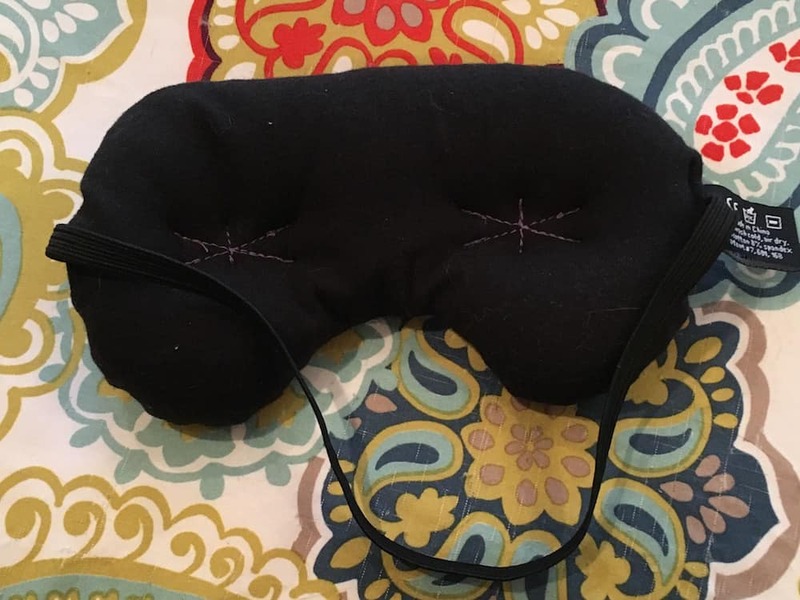 Five Star Review: “The sewn eye areas clearing your eyes makes [the IMAK Compression Eye Pillow] way better than every other mask I’ve had. The beads inside allow you to sort of form/shape it around your face for ideal light blocking and comfort.”—When I was relaxing on my back instead of trying to sleep on my side, I also appreciated the way the ergoBeads distributed around the shape of my face, and how the stitching in the mask kept it from putting too much pressure on my eyes. One Star Review: “Head strap is very flimsy for something as heavy as this.”—I (and, from the looks of it, all of the one-star reviewers on Amazon) agree 100% about the strap. It’s simply not designed to resist the kind of stress put on it by the weight of the mask. That being said, a few reviewers noted on Amazon that the “wire adjusters” fell off the mask, and from the photos they shared, I feel that I should state, in IMAK’s defense, that what these people saw were not meant for adjusting the mask at all, but rather were very short twist-ties meant to hold the mask’s strap together in the packaging. Return Policy: Standard Amazon return policy if purchased there. It’s unclear whether the manufacturer offers any additional guarantee. 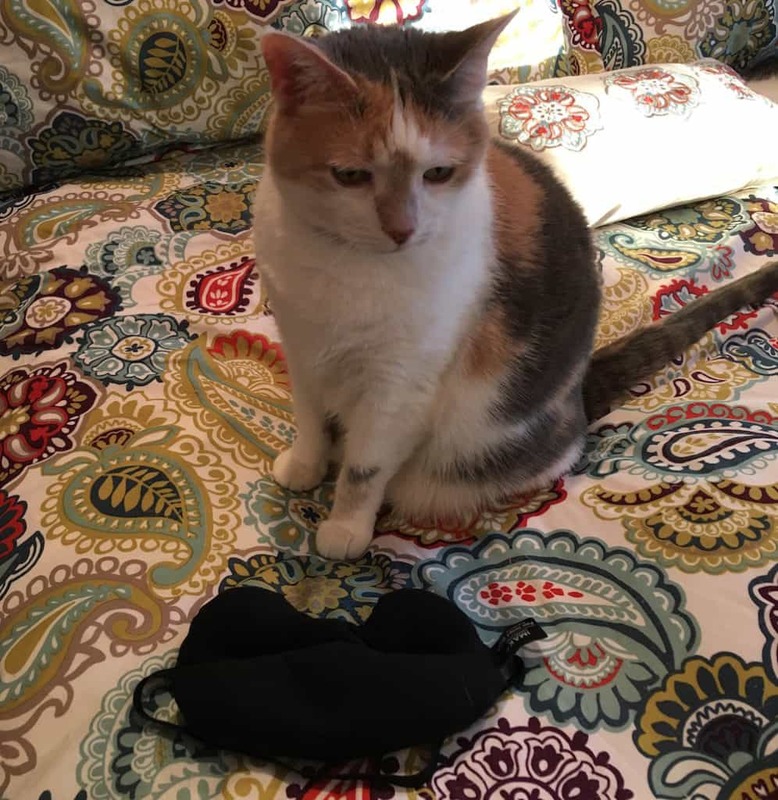 I’m really shocked to see that the mask is the #2 sleep mask on Amazon, because while I absolutely loved taking a twenty-minute break in this mask, it was extremely uncomfortable overnight. (That said, judging from the reviews, plenty of other people manage to sleep in it just fine, so the key difference might be that I’m a side-sleeper.) 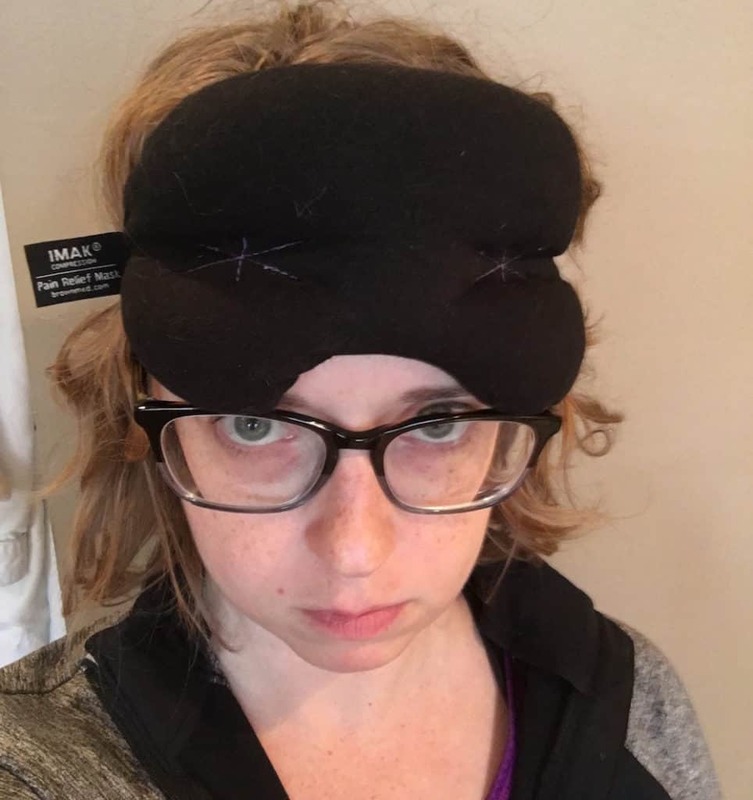 Based on my own experience, I can’t in good conscience recommend the IMAK Compression Eye Pillow if you’re looking for a better night’s sleep. But if you want to enhance your after-work relaxation (or your post-yoga savasana), I think you’ll quite enjoy the mask. Ready to buy? 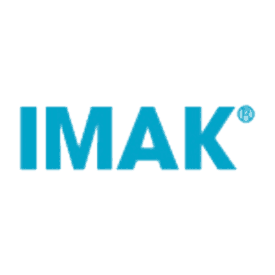 Get the Imak Mask On Amazon!